Blusher is a perfect way to give your looks an instant lift. Give your complexion a bloom of colour with this indispensable beauty aid. Follow this simple step-by-step guide recreate a youthful glow with powder blush. 1. Make sure you have applied the rest of your makeup first. Blusher should always be applied over the top of your foundation and face powder. 2. Make a fish face or a “selfie” pout, this will help you find the apples of your cheeks. 3. Dust your blush over the compact with a large soft brush. If you have taken too much on your brush , tap the handle on the back of your hand to remove the excess. 4. Start applying the colour on the fullest parts of your cheeks, directly below the centre of your eyes. Then dust the blusher over your cheekbones and up towards your temples. 5. Blend the colour well towards your hairline, avoiding harsh edges. This technique should effectively place colour where your would naturally blush. Bonus Tip: The correct way to apply blusher is to use half as much blusher and twice as much blending as you think you need. Follow this simple step-by-step guide recreate a youthful blush with cream blush. Breaking all the traditional beauty rules, cream blusher is best applied with your fingertips. It is put on after foundation but before translucent powder. 1. 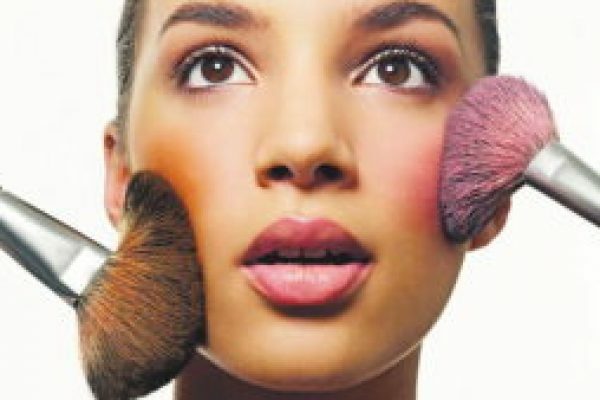 To apply, dab a few dots of cream blusher over your cheeks, from the plump part up towards your cheekbone. 2. Using your fingertips, blend well. Build up the effect gradually, adding more blusher to create the look you want. Or if you prefer you can use a foundation wedge to blend in cream blusher. Bright Idea: If you suffer from under-eye bags, distract onlookers by sweeping your blush along the upper ridge of your cheek bones and taking the colour out toward your temples, this will give your face an instant lift. Did you know? For perfect blusher application, it is best to choose a tone that matches your face when its flushed after exercise.